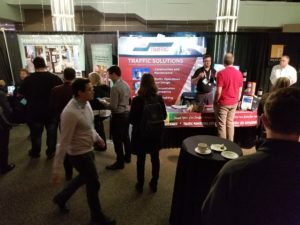 September 1, 2018 Can-Traffic Services attended it’s first annual conference with the Transportation Association of Canada. The association is a not-for-profit national technical association that focusses on road and highway infrastructure and urban transportation. The conference brings together service and supply industries from coast to coast. Networking with companies from various technical backgrounds from across Canada was an exciting opportunity for Can-Traffic Services. The TAC Conference 2018 brought together many informative speakers, educating those involved in some of the latest developments and technologies in the traffic industry. 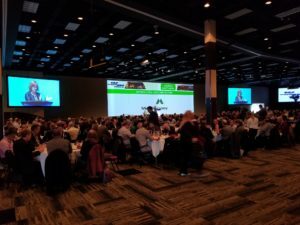 With over 60 exhibitors and a sold out show, the 2018 TAC conference was a huge success. The conference utilized a USB networking device called a POKEN. Poken is a digital business card used to collect and exchange information, and network. Booth visitors collect all your company information and brochures digitally from a Poken Touchpoint. Each TAC delegate received a Poken USB device to exchange contact information and receive digital material. The device links to an app on your phone and independently tracks all new contacts engaged at the booth or otherwise.